Thanks to PlayStation for hosting the trailer for this game. Yesterday, I earned my 13th platinum! This was a fun game, it has 12 different endings, spread out over three story branches. You get swallowed by a whale, from there, you can either put on barrels, don’t put on barrels, and wait it out with three ladies who were previously swallowed by the whale. Since the game presents it from left to right, that’s the order I went in. It wasn’t a bad game, and I enjoyed it for the most part. There is this one segment where you race against Death that I completely didn’t understand what I was doing so I kept holding down the R2 button and nothing was happening. Then I read that I was either supposed to click on one of the men or Death. By then, I was pretty tired and went to bed. Then I played a few more times and got two or three playthroughs completed. I think that’s the best way to play this game, maybe do all four storylines of a branch and then come back the next day, or just remember you choose the right cave so next time, you will choose the left cave. The game can become very repetitive, once you finish an ending, you will come across this sea monster who will tell you that you have finished an ending but she hopes to see you again. I was hoping when you finished the very last one, she would say a different line of dialogue but she just repeated the different ending line. That was disappointing. You will see the sea monster either underwater or above water, pending how you finished an ending, then you will go to a coffee shop and the guy there will essentially say the same thing. 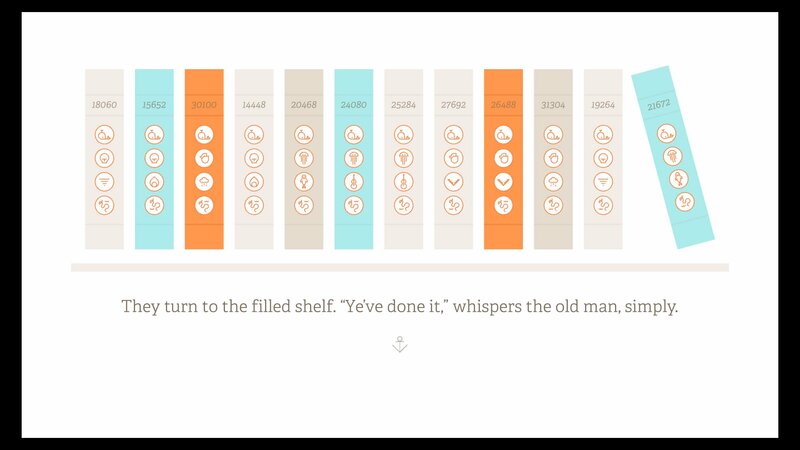 But he will show you a bookcase of all of your endings as you progress through the game. He will say you have completed the shelf, which was nice. I’m not sure why they wrote one character with a conclusion line but not the other. I didn’t use a guide until the very end, to get my last two trophies. I was missing Out of the Deepening Darkness and Nice Day. There is a segment when you are stuck in a maelstrom that I made too much of a game out of, you are supposed to either widen (R2) it so the men go all the way down, or shorten (L2) it and have the men break free of the storm. I was going back and forth and essentially, kept it open so I ended up doing that playthrough twice as I didn’t realize which I one I did originally. If I had thought about it, I should have known I didn’t close the storm but I was just ready to get the Platinum at that point. For the other trophy, there are two seals that turn the men into seals and they say as long as you stick together, you’ll make it to the surface but I didn’t keep them together so they just got carried up to the surface. It took some doing but I had them stick together and got them to the surface and got the platinum. It is supposed to take two hours but I was using it mostly as a break from Arkham Knight. Last update regarding Arkham Knight, as I’m done with the game. I attempted some additional AR Challenges but I’m not doing anymore of those, knowing I can’t get even 20 of them, kills my buzz. I’m pretty sure I barely got ten or 15. I did beat the game on New Game Plus, and the fights were not all that bad, including the underground tank vs tank fight and I didn’t even have a harder time with Arkham Knight, I avoided his crew, got underneath him, grappled up and did those quick moments and then took out his goons then. Then repeat that twice more, so all for all, the only real problem I had was the 60 tanks outside of GCPD during the assault. After like 15 tries, I finally wussed out and stuck to the left side of GCPD (where that breakable wall is), and I would come out, attack, and hide out. A few tanks and drones came to me, which was nice but for the most part, I would take out five or six tanks, fire a slew of missiles, and let Barbara do her business. It was a frustrating matter prior to the final time I completed it. Same for the underground tank fight, that third round took forever! I was able to acknowledge that the long load time was for me to strategize and to calm down but I just wanted it to reload immediately. Same for the tank battle, just get me in there, I heard Batman and Oracle counting down from five so many times, it started becoming a tad maddening. I was hoping to get Savage Metal so it was nice to finally get it when I did, it was during one of the AR challenges. At first, I though Long Halloween was a bronze medal but I see now that it is a silver medal. I was expecting a gold medal so when it wasn’t gold, I didn’t note what type it was until typing this. Silver is better, as it does take a lot of time and skill to get through the story. Besides the tank battle, I wouldn’t even say the game was that much harder. I could do the side missions but there is no real incentive to do it so I’m pretty much done with it. I’ve started Roundabout, I’m not sure how many chapters there are but I’m on the third chapter, with the farm. It is a fun game thus far. You play a revolving limousine driver, Georgio Manos, who is a lady. Whenever you pick up passengers, you get a fun live action sequence. The story is fun and the driving mechanics take a minute to get used to them but there is no way I’m going to be able to get everything done in the game. Especially as one of the trophies is unattainable right now but even if was an option, I probably wouldn’t be able to get it. It is the trophy you receive from completing everything, so of course, that would be the trophy that would be glitched. The game only has 18 bronze trophies and one silver, so I don’t feel compelled to get everything. I do want to just go down the list and just get those trophies as it seems pretty doable that way. I’m definitely going to finish the main story first, and then from there, I’ll start checking the list. I have to start pressing L3 for the horn as having to do it literally a thousand times doesn’t sound great and it isn’t like the horn does anything in-game. I’m in the habit now of dying, blasting my horn ten times, and trying again, as I’m not concern at all about the time limit, so I imagine I’ll get that trophy eventually. There is a trophy where you have to drive for 8 hours without pausing, and I’m not doing that one either so the pressure is off from this game. Once I’ve had my fun with Roundabout, I’ll go back to Uncharted 3 Normal play, I’m on the chapter with all of the boats and I need to figure out the proper route through them all. I was thinking about playing a different game in-between my Normal and Hard mode playthroughs, and I thought Life is Strange would be a wonderful game to put some distance in-between the two games. But now that I’m typing that, I wonder if I shouldn’t waste the muscle memory and just go back to back playthroughs. My problem is that the way I’m planning on doing it, I have to play Uncharted 3 three times, Normal, Hard, and Crushing. Which I’m all for doing (so Crushing doesn’t, well you know, crush my desires), but that is a lot of time to spend with one game. A great game but still. I’m just thinking back on how Crushing was like in Uncharted 2 and having a Hard playthrough would get me even better at the game (I’m hoping), so Crushing will feel doable. I’m all about the self-motivation. I’m using psnprofiles to check and that is how I did Uncharted 2, Normal (which gave me Easy), Hard, and Crushing. Apparently it only took me six days to beat the game on Hard. Whenever I see that giant gap in my gaming timeline, I have to realize that was when Fallout 3 killed my PlayStation 3 with the Yellow Light of Death (YLOD). Which I’ve learned that Fallout 3 and New Vegas both killed many PS3s back in the day. Proving that Supermassive Games has an awesome PR team, they released another trailer for Man of Medan! Thanks again to PlayStation for hosting this video as well! Also, thanks to WordPress for it keeps capitalizing the S for me. Odd that PlayStation is hosting the video as the game is supposed to be on all systems but who knows, I’m a PlayStation guy so that works for me. Such an amazing trailer and it gave me real Peter Stormare/Dr. Hill feels from Until Dawn. Which I’m sure is on purpose. Of course, I didn’t know about the trailer until recently so I changed my Google account to notify me of all news pertaining to Man of Medan so I’ll be even more updated. Which, also on my own, I found that we can preorder the game through Amazon! But since it says December 31, 2019, I’m holding off in case my lovely wife wants to buy it for me for either a late Christmas gift or early Birthday present. I love that it is a thirty dollar game, as it is supposed to be half the length of Until Dawn, so a five hour game, and $60 seems a bit much for that. I was willing to spend $60 but $30 makes it even more doable. I was tempted just to download the game straightly from PSN, but I’m still old fashion and I like to have my disc. I’ve read numerous times that it doesn’t change the download size, and the free games from the PSN has gotten me in the habit and appreciation of just scrolling over and starting a new game. That’s what happened with Arkham Knight, I beat the game, attempted some AR Challenges and didn’t want to make all the noise of ejecting the disc, opening Uncharted 3’s case and inserting that game into the PS4. I wouldn’t think it makes a lot of noise at noon but it is so much more quiet at 11:30pm, that it could wake someone up. 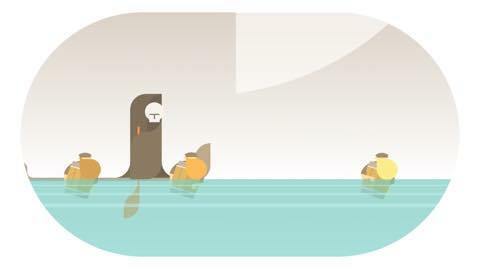 So I just went back to Burly Men at Sea and committed to that game. I also learned how to spell “Burly” as I keep wanting to throw an e in there but that isn’t how you spell it. Another game I have my eye on is Hellblade : Senua’s Sacrifice, which has been strictly a downloadable game, but might be coming to disc. Which I guess I’ve been waiting for a disc copy so then I can add it to my wife’s Amazon account so she can maybe buy it for me. A little harder to do without the hyperlink. I’m having that issue now with the $40 PSN membership (down from $60). She used the link but since it isn’t a physical card, she’s bummed that she’s going to have to print it and give it as a lame presentation of a gift. I told her not to worry about it but I get it too. Heck, even Batman : Enemy Within, TellTale’s second Batman game (and most likely last), that disc only comes with the first episode and a code for the season pass, so buying the disc is essentially pointless as you are still downloading the rest of the episodes. Yet, it is another game that I want and it is hard to put aside $30 for a game but these are nice goals to have. I imagine Man of Medan is more of a placeholder date and it will come out earlier in the year, which is another reason why I don’t want to preorder it now, as I might not have the funds for it when it first comes out. Not like it will surprise me (I hope) but I rather not get ding for it either.